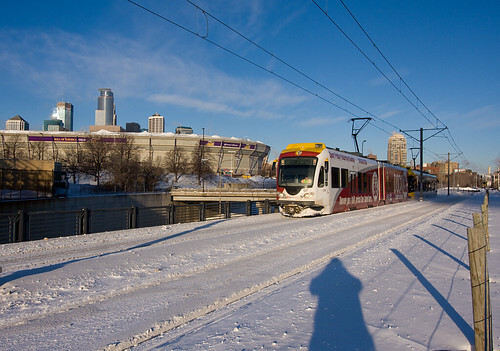 The recent winter storm brought nearly 20" of snow to the Twin Cities, which was enough to collapse the roof of the Metrodome, shut down the airport, and suspend bus service. Which modes of transit kept running? Why, light and commuter rail, of course! Note: if you're going to ride light rail to this location, the Metrodome-East station is much closer than Cedar-Riverside... the bridges here are deceptively long. This shot will be featured in the March 2011 issue of Railfan & Railroad.